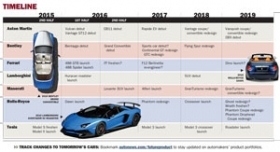 The Ferrari 488 Spider is due to arrive in the U.S. in late spring. TURIN -- With the 488 Spider that debuts this week at the Frankfurt auto show, Ferrari completes the overhaul of its eight-cylinder model range. Ferrari has now switched from normally aspirated V-8 engines to downsized twin-turbo V-8s. The change began last year with the introduction of the California T convertible and continued with the 488 GTB coupe that debuted in March. The move is part of Ferrari's goal to reduce fleet carbon dioxide emissions by 20 percent by 2021 while simultaneously boosting performance. Click here to download a PDF timeline of exotic brands' product plans. Meanwhile, FCA CEO Sergio Marchionne says a smaller model is in the works. Called Dino internally, it could be powered by a 500-hp-plus V-6. 488 GTB: The replacement for the 458 Italia will arrive in the U.S. in January. With its new downsized turbo, the 488 GTB is more powerful and greener than its predecessor. The twin-turbo 3.9-liter V-8 488 delivers 661 hp and emits 260 g/km. The 458 Italia, with a naturally aspirated 4.5-liter V-8, produced 562 hp and emitted 275 g/km. To prevent turbo lag the 488's twin scroll turbines -- made by Japan's IHI -- feature ball bearings and titanium-aluminum compressor wheels for reduced friction and faster response. 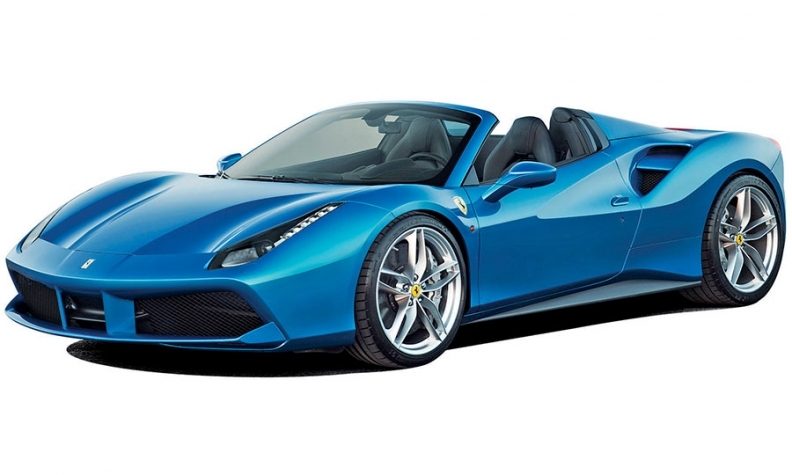 488 Spider: Like the coupe, the Spider also switches to a twin-turbo V-8. The model, which debuts this week in Frankfurt, will arrive in the U.S. late next spring. California T: Redesigned last year, Ferrari's 2+2 convertible won't undergo major changes for several years. FF: The first all-wheel-drive, four-seat Ferrari, introduced in 2011, could be freshened next year. F12 Berlinetta: The V-12-powered two-seater could be re-engineered around 2017. Ferrari is working on a limited edition, high performance variant called F12 GTO. Selected customers have previewed the model. For this special version, the 6.3-liter engine gets a boost from the current 731 hp to almost 780 hp, according to Italian press reports. Dino: Marchionne said in June that a V-6 model is "not a question of if but when." He added that Ferrari may produce a 500-hp model "but it will not be a cheap Ferrari." The new model does not yet have a fixed time frame or a name. The Dino's 2.9-liter V-6 would be derived from the 488 GTB's twin-turbo 3.9-liter V-8. Dino, one of Ferrari's most iconic names, was used on V-6 and V-8-powered models in the 1960s and '70s.